To roll or to stamp—that is the question. Your mission is to source a high quality, custom steel part to be manufactured efficiently at a relatively low cost. As you well know, there are a variety of different metal forming techniques when sourcing a new project. But how do you choose between two popular methods, roll forming and stamping? How you will manufacture your custom steel part is an important decision that requires you weigh and prioritize a variety of factors. The stamping process cannot produce long parts efficiently. A stamping press does have the ability to form shorter parts individually, which then could be joined together to create a longer part, but the secondary assembly costs of this technique could add up in the long run. Roll forming is a stable process that is capable of producing metal parts of any length efficiently. The only length limitation of roll forming is the length of the coil being fed into the line, which has the added benefit of producing less scrap than sheet metal. When quantities are more substantial, the roll forming tooling can be prorated over the entire production run, and total cost for the job might end up being less than for metal stamping. That being said, both roll forming and stamping are well suited for higher-volume productions because the per piece set-up and labor costs should decrease as production levels increase. More often than not, roll forming will be more labor-intensive and may require a higher per piece cost, depending on volume. Regardless of the production method selected, costs and total cost of ownership can be reduced earlier in the process, through improvements in efficiency and design. Tool maintenance tends to be less for a roll formed section than for metal stamping because roll forming has the ability to produce parts in one operation in continuous mode. The best way to determine the scope of tool maintenance needed for each process is to evaluate the volume of your run. One of the major benefits of stamping is that it can produce complex parts in a short amount of time. Stamping can be highly automated and can incorporate value-add operations such as in-die welding and assembly without significantly increasing production time. Roll forming allows you to consolidate secondary operations such as hole punching and trimming into one efficient forming operation. This will decrease your production time in the long run. Your metal sourcing decision is not an easy one, and that is why it is important to weigh each factor and each option carefully. Regardless of which process you choose, the most important element is making sure you align with a strategic manufacturing partner that will help take your business to the next level. 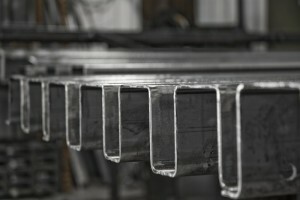 To save money with the most efficient design for your needs, look for a partner with a seasoned engineer on-staff who can recommend the most effective metal forming technique. To learn how Hynes’ engineers can partner with you to save money and efficiently create a quality product, view our engineering services. Editor's note: This post was originally published in November 2013 and has been updated for comprehensiveness.